Did you walk by a mango today? Did you look at a mango and think it looked interesting, but just didn't have the energy to think about what to do with it? This Mango and Coconut Milk Risotto could cause you to never walk by a mango, again. Believe me, sometimes I literally slow-run through the grocery store or even the Farmer's Market just because of time. I put my head down, ignore the ideas and the seasonal colors, and just get the essentials for the next few days. That's when I grab a few apples, a couple oranges, maybe a bunch of bananas and try not to knock down the displays turning the corner on two wheels. Now, mangos have made it even to my "quick grabs". I was fortunate to have a weekend recently at CampBlogAway for food bloggers and one of the sponsors was the National Mango Board (yeah, who knew there was one of those, right?) When I returned home, a few days later, I received a box of gorgeous mangos just to enjoy. Hopefully, my getting these mangos literally dropped at my doorstep will benefit you, too. I'm not going to let food go to waste, no way no how, so I began experimenting with recipes. I'll post a few as it goes along, but I must say this one I just couldn't wait to show you. First, let me tell you a couple things I learned about mangos, and maybe that will make you feel very at home with this fruit, too. 1) Mangos can be eaten when they're almost ripe (ie. a salsa), ripe (ie. this risotto) and very ripe (ie. caramelized and on top of ice cream), depending on how you fix them. 2) Mangos will continue to get ripe if you leave them at room temperature, or you can stop them from getting any riper by putting them in the refrigerator where they will keep for several days. 3) Mangos come in a variety of colors and that's not the way to judge their ripeness. A ripe mango will have a light "give" and be a little soft to the touch. The easiest way to cut a mango is to stand it up on a cutting board, stem end down and hold. Place your knife about 1/4 inch from the widest center line and cut down through the mango. Flip the mango around and repeat the cut on the other side. The two ovals are the "cheeks" of the mango. Cut parallel slices into the mango flesh, being careful not to cut through the skin. Scoop the mango slices out of the mango skin with a spoon. Also, after cutting the parallels, I added a cut across before scooping, so I had little cubes of mango. Then I just scooped them out and held them nearby until the Risotto was almost done. Adding the cubed mango near the end allows the fruit to stay in nice firm little bites, while still blending with the creamy risotto. 3) Add the wine and stir to incorporate all the flavors formed in the skillet. Continue heating and stirring until almost all of the liquid has been used up. 4) Add the Coconut Milk in increments (about 1/2 cup at a time), stirring frequently to allow the rice to absorb the liquid each time. Season along the way with the salt/pepper and nutmeg. When all the Coconut Milk is used, fill the empty can with water and continue until that is used up also. 5) Just as the last amount of liquid has been used up, add in the cubed mango and fold gently. (If you want to add Arugula, do this now also.) Taste and season. Now, go walk up to a mango and grab it! Bacon Studded Polenta with Tomato Gravy - Ciao, Yawl! Some of us were born to color outside the lines, inside the lines and sometimes draw our own lines. Combining Italian Polenta with crispy bacon bits, then smothering it with a deep Southern Tomato Gravy is one of those meals where the lines between the countries get blurred. What comes out of this marriage of "Ciao and Chow" is good country eating, no matter what country you're talking about. Cowgirl Chef: Texas Cooking with a French accent. Ellise (Cowgirl Chef) is a true Texan who has been living, learning, teaching, growing and loving in Paris, France for the last few years. Her story of how she embraced her authentic and true self, talents and dreams by meeting the challenge of a brand new environment is inspiring (and the recipes are down right "must-makes.") Ellise is one of the original foodbloggers to start our unique monthly lunch meeting online several years ago. I was there for the very first one and we all made our own versions of a BLT sandwich. It's a great example of one of the good things that come from our tech-driven journey. Picking something Italian was a no-brainer for me. I've been obsessed with all things Italian for many years and will be fortunate enough to be packing this week to visit our good friends in Cossignano, Italy and stay at their Organic Agriturismo (Fiorano.) 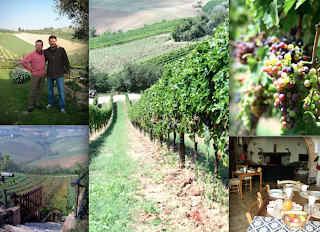 Paolo and Paola are part of the Slow Food Movement and are very active in Organic wines, foods and conservation. I speak a little Italian from years of studying and soaking it up, although it seems to be with a good ol' Southern twang no matter how hard I try to pretend. My grandmothers in North Carolina made Tomato Gravy and poured it over biscuits, toast, rice and grits. It's a poor man's marinara sauce and it's packed with tomato bits, bacon flavor and rich roux. 1) When the liquid begins to simmer, rain in the Polenta grains. This means do NOT pour it all in (that makes it clump.) Rain it in, sprinkling it gradually and stirring while it goes. 2) Reduce heat and stir often so not to scorch the Polenta. 3) Keep in mind, it's easy to add a little more liquid if it's too thick, but not so easy to make it thicker if you add too much liquid too quickly. 4) Adding butter makes it a little bit looser, cheese will make it a bit thicker. The liquid used in Polenta, like rice, can be water or stock, milk, or something in your imaginative recipe developing "coloring book." 1) In a skillet, cook the bacon on Med. until crispy, remove and chop into small pieces. Pour off the fat/grease and save for the Tomato Gravy. Save the bacon coated skillet for cooking the gravy in also. 2) In a deep saucepan, bring the water, milk, salt and pepper to a low simmer, stirring so the milk doesn't curdle. 3) Rain in the Polenta, stirring constantly until the Polenta is creamy. 4) Reduce the heat to low, stir often so it doesn't scorch. Now is when to add a bit more liquid if needed. Stir in the bacon pieces now. Cook and stir often for about 15 minutes. The Polenta should be thick for this recipe. 5) Stir in the butter and turn out into a buttered 8x8 baking pan. Leave to room temp or chill for later. 6) Before serving, cut into squares and triangles and broil or fry for just a couple minutes until crisp on the outside. *It can also be used without this step. 1) Using the same pan the bacon was cooked in, add the bacon fat/butter and the flour, salt and pepper. Cook and whisk on Med. until light brown and a nice roux has been created. 2) Add the chopped tomatoes and any reserved juice from chopping. Lower heat to Low/Med and Whisk together. 3) Slowly whisk in the warmed stock and continue cooking on Low for about 15-20 minutes. If it's too thick, add a little water or more stock a little at a time. Season to taste. 4) Serve poured over the Polenta or biscuits, rice or scrambled eggs. Mmmmm. Congrats to Cowgirl Chef! Hope to see you on tour! So many people loved my Drunken Grapes with Goat Cheese that I decided to get more grapes drunk and see what happened. This time, I soaked the seedless yummies in a nice bright Smoking Loon Chardonnay. I'll admit some of the fun was popping a few of these while I decided what to do next. With the rest of the white wine just sitting there staring at me, I was inspired to use it for poaching a few shrimps. It was so easy, I'm almost embarrassed to put it into a recipe form, but I'm too food-nerdy to not do it. It probably doesn't come as a shock to find out that crisp Chardonnay, grapes, Herbs de Provence and large fresh lightly poached Shrimp are delicious together, right? 1) Put the picked grapes into a container and pour the wine to cover. Let soak for at least 2 hours, or up to 3 days in the fridge. 2) Pour the rest of the wine (at least 1-2 cups) into a deep saucepan or skillet, add the herbs and the water. 3) Bring to a boil, then immediately turn down the heat to a bare simmer, no rolling. Add the shrimp and poach (below the boiling point) for about 3-5 minutes. Drain the shrimp and chill. 4) Peel the shrimp and assemble by putting one grape inside the curl of each shrimp and attach with an appetizer pick or skewer. 5) Arrange on a bed of finely chopped fresh parsley, fennel fronds or dill. Serve chilled or room temp.